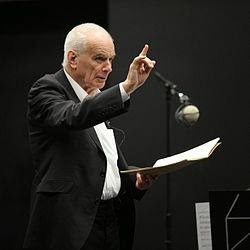 Last night at the Proms (Monday 8 September) the Scottish Chamber Orchestra (conducted by Ben Gernon) played tribute to their former conductor and composer in residence Sir Peter Maxwell Davies (1934-) and helped celebrate his 80th birthday in style at the Royal Albert Hall. Davies was born in Salford and knew from an early age that he wanted to be a composer. He won a scholarship to studying at the Royal Manchester College of Music where he met fellow students Harrison Birtwistle, Alexander Goehr, Elgar Howarth and John Ogdon. Together they are known as the Manchester School. After college he studied for a year with Goffredo Petrassi in Rome on an Italian government scholarship, later moving to Princeton University where he studied with Roger Sessions, Milton Babbitt and Earl Kim. After a year in Australia as composer in residence at the Elder Conservatorium of Music, University of Adelaide, he returned to the UK, moving to the Orkney Islands in 1971 where he still lives today. He founded the St Magnus Festival in 1971 on the Islands, which is well known for its support of new composers and artists, and was involved for many years in the Dartington Hall summer school. In the early days his music was seen as shocking and subversive – in 'Eight Songs for a Mad King' (1969) the king even grabs the violinist's instrument and smashes it. But some seven operas, two ballets and numerous works for orchestras large and small later, this is now understood and admired as the virtuosic piece it is. His music is often written with specific performers in mind, including the Pierrot Players, which he founded in 1967 and was reformed as the Fires of London in 1971. In the 1980's Davies was made the conductor and composer in residence for the Scottish Chamber Orchestra and was commissioned to write ten concertos for them by the Strathclyde local authority. Since then he has conducted other notable orchestras including the BBC Philharmonic. In 1981 he was made a CBE in 1981, knighted in 1987, and was appointed Master of the Queen's Music in 2004. Tonight's performance brought back together the Scottish Chamber Orchestra and Davies for an exploration of the sea and light of the Orkney Islands. First on the list was the 'Concerto Overture – Ebb of Winter' written last year just before he became ill with leukaemia. Wearing the newly designed Scottish Chamber Orchestra tartan Davies sat on an easy chair in the corner of the stage and explained, "The music was telling me something [...] it knew something I didn't." A picturesque painting of the islands, this overture had it dark moments – especially brought out on horns and the low rumbling of the bass bassoon. Nevertheless it also had light and air and the stirring of hope on lyrical strings in the middle section, which Davies described as "Rebirth". After a brief return to general growling, the strings again rallied round. When the horn was next heard it was more temperate and the work ended on a positive note. Taking about the work Davis said that it ends "optimistically – it had to end like that didn't it?" When asked for a reason why he chose 'Strathclyde Concerto no. 4' (1990), Davis said, "I'm very fond of them all" but this one in particular was very "meditative [...] changing contour all the time". His idea was to produce a work that was "full of the sheer wonder of taking a very long free walk". American clarinettist Dimitri Ashkenazy took on the solo role in this his first Proms performance. The five movements (Lento - Allegro moderato – Adagio – Cadenza – Epilogue) all run together and were linked by the use of what sounded like a traditional Scottish folk tune – although Davis swears that all the tunes he uses are from his own imagination (i.e. flattery not plagiarism). The tune was at first fragmentary, with the clarinet getting nearer and nearer to it. But eventually in the 'Epilogue' we heard the tune in its entirety, just before the atmospheric, misty Japanese temple gong faded out onto a last low cello rumble. In and amongst the heather of the dances were trilling bird calls, the padding of animals, and hints of bagpipes. The final work of the set was 'An Orkney Wedding with sunrise' (1985) written about the wedding of some friends of his. It describes the increasingly drunken musicians and guests from people arriving, the band tuning up, to the dance itself. Here the sound of bagpipes was suggested by the strings and there were some pretty solos as the music increasingly slid about. At one point one of the stage hands came on stage with drinks for the composer, conductor and section leads. The violin extended solo at this point was performed with a tricky drunken out-of-time accompaniment and everything got more fun until the timpani attempted to bring everyone back together for a last effort. The sunrise was heralded by a piper (Robert Jordan) in full regalia marching onstage from the wings – a fitting end to the concert for Davies who loves Scotland so much. But how could the concert end? Well with a rendition of 'Happy Birthday' arranged by one of the members of the orchestra of course. I hope there was a party for Max afterwards.